Letting weak, unreformed banks back into the lending game will just be the start of a steady erosion of the central bank’s disciplining power. After sending two pesky central bank governors packing in a little over two years, Indian bureaucrats have turned their attention to unwinding the monetary authority’s autonomy. Their first move, unveiled Thursday, is an innocuous – even laudable – infusion of 410 billion rupees ($5.9 billion) into troubled state-run lenders, bumping up this fiscal year’s outlay for bank recapitalization by 63 perc ent to 1.06 trillion rupees. The fresh capital partially replaces a shortfall in the 2.11 trillion rupee bank recap announced in October last year. But rather than split hairs, investors should worry about what comes next: a jailbreak for four or five state-run lenders. 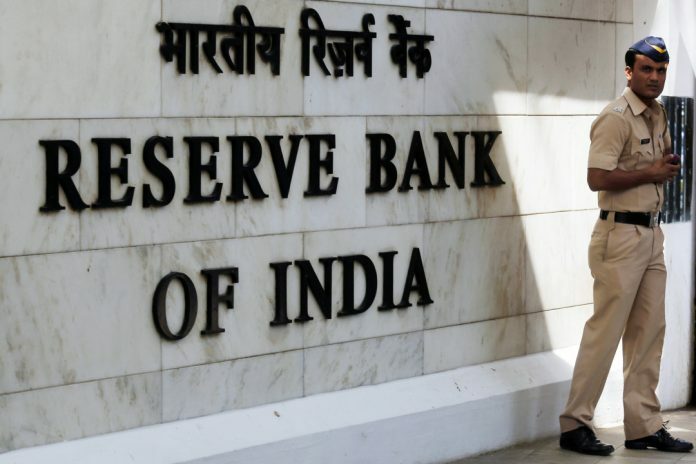 According to reports in Indian media, Allahabad Bank, Bank of India, Bank of Maharashtra and Corporation Bank are likely to be released from the Reserve Bank of India’s correctional facility for wayward lenders with depleted capital. It’s way too early. Take Allahabad Bank, one of the four lenders expected to be freed soon from the RBI’s lending curbs. 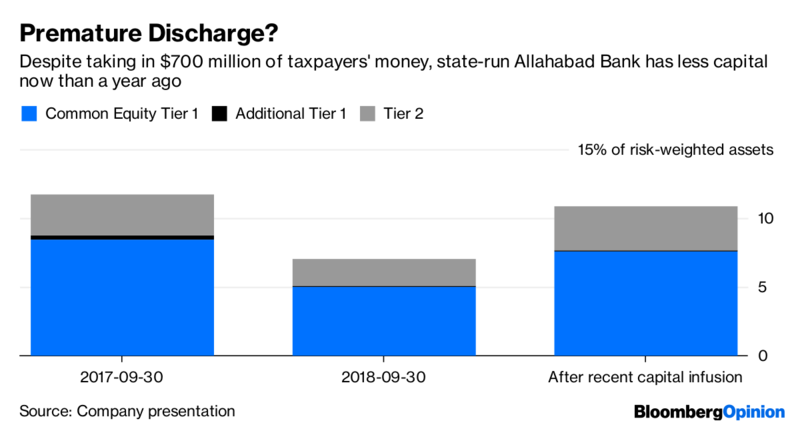 Allahabad has made $730 million in loan-loss provisions so far this fiscal year, running through the entire $700 million of taxpayers’ funds it received as fresh capital during the period. Its capital situation is worse than it was a year ago. And while the government may be right in thinking not much more can go wrong with large corporate debtors (17.5 percent of Allahabad’s loan book is already nonperforming), it doesn’t mean other advances won’t go bad. But then, the general elections are precisely why the government wants an early release. State-run lenders control 70 per cent of India’s banking system assets, and 11 out of 21 of them are facing regulatory lending curbs. That’s not good for winning polls, which must take place by May. If nothing else, banks can use their excess deposits to buy loan portfolios of shadow lenders. These financiers, which don’t have deposits of their own, are playing an increasingly crucial role in ensuring the country’s ongoing banking crisis doesn’t freeze credit. That’s why the government picked a fight with the RBI for, among other things, putting so much of the formal banking industry in the doghouse and not offering a liquidity line to shadow lenders that were filling the gap. 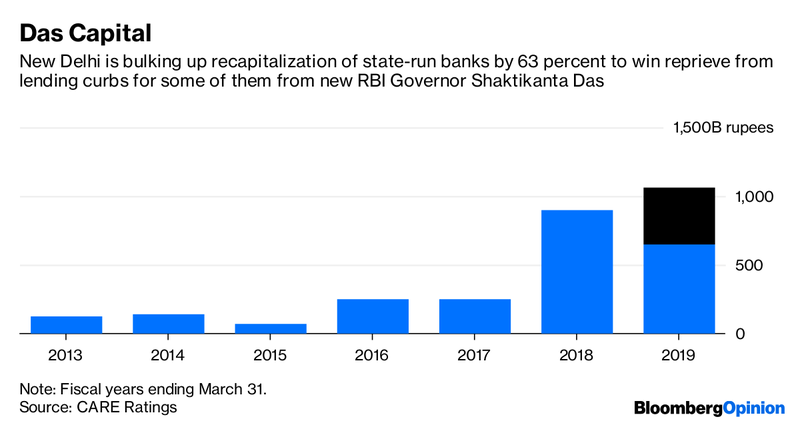 To complete the assault on the central bank’s autonomy, New Delhi even planned a raid on the RBI’s “excess” capital to recapitalize the state-run lenders. The confrontation ended with the resignation of RBI Governor Urjit Patel. S&P Global Ratings has warned about the increasing involvement of the government in the central bank’s affairs, and how this could “undermine the hard-fought improvements in the banking system over the past few years.” But who cares? Since markets will cheer a new credit party, an emboldened New Delhi will push for more concessions from the monetary authority. Former bureaucrat Shaktikanta Das, who’s now heading the RBI, is unlikely to resist. Letting weak, unreformed banks back into the lending game will be just the start of a steady erosion of the central bank’s disciplining power. The ultimate goal is elsewhere. At the end of the day, nobody (except the employees) cares much about smaller state-run banks. It’s the defaulting corporate debtors – and their political clout – that matter. The last two RBI governors, economists Raghuram Rajan and Urjit Patel, stared down these powerful corporate interests, responsible for $210 billion in stressed banking system assets. If the asset-quality review that Rajan ordered in 2015 helped unearth the true scale of bad loans in the system, it was Patel’s February move to give delinquent large debtors 180 days to have loans restructured (or face insolvency tribunals) that made businesses panic. The only job of the central bank is to IMPLEMENT financial policy. It does not make financial policy. That policy is made by the duly elected central government. End of story. The Economist has cautioned that India is falling out of favour. After the general election, a lot of bills will come due. A lot of jobs may also be on the line.